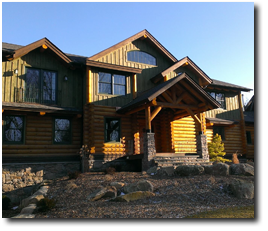 Want to know what it's like to work with Real Log Homes®? 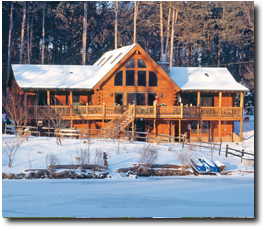 Take a look at what Real Log Homes customers have to say. 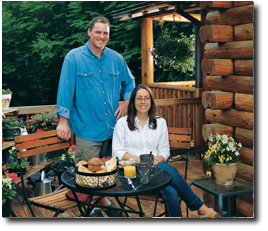 From dream home stories to delightful anecdotes, these Real Log homeowners were eager to share their experiences. 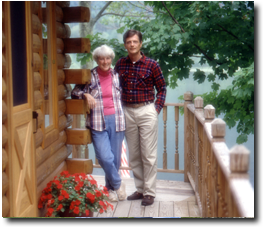 "Mike and I are so grateful to be living in our beautiful "log dream home" year round. We are so happy we went with Dave Allaire from C.M. 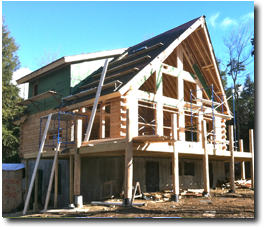 Allaire and Real Log Homes to purchase and erect our logs and roofing system. Thank goodness Dave was so persistent in staying in touch with us after meeting him at a Log Show. We had fully intended on going with another log company we were very familiar with from vacationing up at MooseHead Lake in Maine for 15 yrs." We looked extensively at many log home kits and after much consideration made the decision to go with Real Log Homes. The home is closed in at this point and each stage of the build gets more and more exciting. 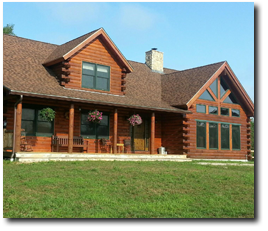 The staff at Real Log Homes addresses and resolves any issues pertaining to the build, courteously and promptly. Their design team drew the plans according to our suggestions and their technical expertise has been greatly appreciated. 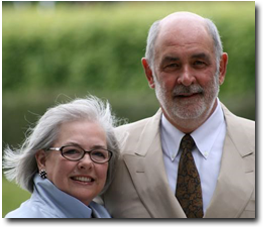 In particular, Mike Heffernan is a wealth of knowledge and ensures satisfaction on all levels. We are do-it-yourselfers and his technical advice and the friendship that developed over time has been invaluable. 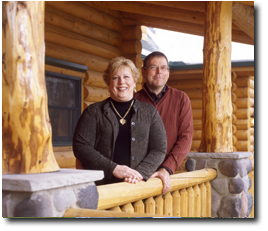 We could not be happier and are proud to recommend Real Log Homes to everyone. He [our Independent Representative] had lots of experience with the log building process. Not only did he provide us with references of log homes he had built, but suggested we visit a Real log home that was under construction. Once a year we invite about 60-70 friends and relatives for a summer picnic. Between relaxing on the deck and fishing on the pontoon boat, there is something for everyone to enjoy. Our guests refer to this as 'going to the lodge,' which makes us feel great. We are so happy about how things turned out." "Some people have a view of log homes, especially if they're not familiar with them, as a dark, dingy one-room space, but once those same people see a modern log home, everything changes. Our friends and family can't believe how warm, inviting and cozy our house is... I don't think we'd go back to a traditional home," says Marie. "There's something unique about the warmth of a log home. Once you put so much thought and time into something, it becomes a part of your soul. We simply love this place." "I have to admit, we decided to go with Brooks [our Independent Representative] in the first five minutes...The other places that we had been to were pushing the log home package, and I just felt like I was buying a car. Brooks and Linda made us feel really comfortable... He was very down-to-earth; he was real; he wasn't looking to sell us anything. He asked the right questions... Living here is like a permanent vacation." "We wanted our home to have tons of character. I didn't want a rectangular-box... [We] wanted a company that could provide logs that were long enough to run the length of the great room." "Our home is a testament to our builder/Independent Representative. He made all the woodwork by hand, and also helped us develop our concepts."